Spam fighters are routinely threatened with lawsuits by spammers. Some spammers carry out their threats and these lawsuits cost money to defend. Donations to the Spam-Fighters Legal Defense Fund help anti-spammers carry on their volunteer work. SFLDF is run on a purely volunteer basis. 100% of your money goes to defend against frivolous lawsuits by spammers. Most of it goes straight to legal expenses. You may earmark your donations to a specific case if you like, or contribute to the general fund. The general fund is used to pay legal expenses in our current cases and is allocated by the of SFLDF proportional to the needs of the defendants. In the unlikely event that there is money left over at the conclusion of a case, the money will be placed in the SFLDF trust fund against future need. Mostly, a warm fuzzy feeling that you're doing something about the spam problem. Contributions to SFLDF are not yet tax-deductible; a non-profit organization is in the works. Donations to SFLDF are not yet tax deductible. Work is in progress to form a non-profit corporation. Donors will be notified when their status changes. Created as a piece of documentary evidence in the Doe vs Falk case, the Encyclopedia of spam is simply a printout of the web site that started the lawsuit. It contains over 1200 pages of useful information on the fight against spam, including over 400 case files on spammers and spam-supporting ISPs. This is a beautifully bound book and an excellent conversation piece. Anybody who contributes $500 or more to the SFLDF will receive a signed copy of the Encyclopedia of Spam as a thank-you gift. 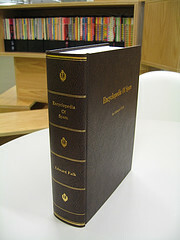 For more photos of the Encyclopedia, visit this page.